One of the enjoyable aspects of my London trips is that, in addition to all the great British and Commonwealth cuisines that get good representation, the London metro area has quite a good collection of Turkish restaurants. Previously, I’ve gotten to enjoy Tad in Hackney, and Likya in Golders Green, and particularly Kazan right down the street from my brother’s flat. Kazan isn’t the only Turkish option in Pimlico, either, just around the corner lies Cyprus Mangal. We’ve been there a few times before, when the food was excellent but I would have called the dining room ambiance “cozy”. But sometime in the last few years Cyprus Mangal had a rather major renovation and we decided it was a good opportunity to drop in and give them another try. Cyprus Mangal is both a dine-in and a takeaway restaurant, and despite Londoner’s love of doing takeaway food, I usually like to dine in when possible, since it’s a great opportunity to talk to the staff and get some recommendations. In this respect, Cyprus Mangal does a great job: the staff is friendly, loves to make recommendations from the menu, and are quite attentive and pleasant to guests. I always like to start off a good Turkish meal with a nice order of break and hummus, and Cyprus Mangal does a good job with both of them. For a mere 1.5 quid, they serve up a generous basket loaded with lightly salted Turkish bread. 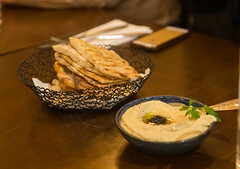 Their hummus is a nicely made, more than a little garlicky housemade spread with just the right balance of chickpea and tahini to be smooth and flavorful without being chalky, both making for a pleasant starter as we waited for our main course. While the classic dish at a Turkish restaurant is either Doner Kebab or Shisk Kebab, I usually find myself first trying out one of the various minced kebabs, either an adana kofte with lamb, or a tavuklu kofte with chicken, since both provide a rather nice combination of crisp exterior, moist interior, and bold spicing. Here, I ofted for the Tavuklu beyti, which is basically the same as the kofte with a different spicing with more tomato in it, and I couldn’t have been happier. A generous kebab of minced chicken, garlic, onion, parsley, tomato, and peppery spices, this was grilled to perfection. 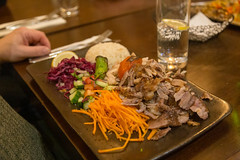 Most of the rest of the table went for the mixed doner grill, which was a similarly presented main course of the house-spiced lamb doner and chicken doner from the rotisseries up front. While lacking a bit of the charcoal tang that my kebab did, this was otherwise a well-executed dish: tender meat and chicken, both nicely spiced and crisped, served up with rice and a pleasant house salad. 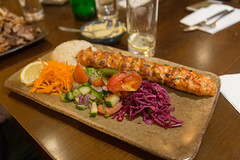 Overall, I really liked Cyprus Mangal, and I’m glad they’ve continued to do well with their improved dining room. I’m still not sure which I liked better if I’m craving a good Turkish meal around Pimlico, but I can certainly say that neither place will disappoint. Like Montreal’s Dragon Beard Candy Stand another place we’ve walked by many times is this little sign in Chinatown that says (well, the English portion at least) simply “Soup Dumplings”. The restaurant itself is called Qing Hua. We’ve been meaning to go there (or their original location over in Ville-Marie) for years, but kept getting stymied by one little factor: They aren’t open on weekends, which is when the majority of our visits happen. But when we were in town for the Death March, several of us were getting hungry, and decided to have a mid-afternoon snack of dumplings. And thus, we were finally able to visit Qing Hua.